Here are a few more food preparations that you can make. 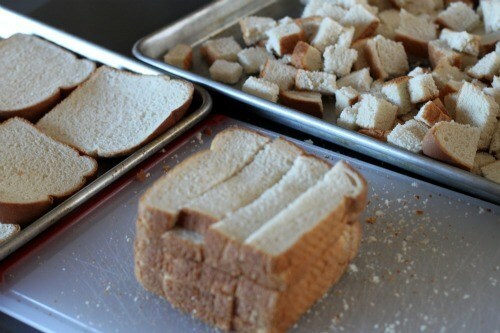 If you plan on making your own stuffing or dressing you need to cut the bread and get it drying out. Cube it and let it dry out on a baking sheet for a few days. The drier the better because then it will really absorb all of the yummy seasonings you will be adding! Fresch bread will give it more substance and will not get soggy as quickly as white bread. If you make your own cranberry sauce (the kind with lots of sugar) you can make that now too. Just keep it refrigerated. Another thing you can get ready right now are your green beans. If you buy them raw, you will want to wash and blanch them now and then they will be ready for whatever you have planned for on Thanksgiving. Some ideas are sauteing them, casserole, and/or steamed. This is enough to dress a 10-15 lb turkey, but also tastes great on the side. In a Dutch oven, melt butter or margarine over medium heat. Cook onion and celery until soft. Season with poultry seasoning, salt, and pepper. Stir in bread cubes until evenly coated. Moisten with chicken broth; mix well. This is another thing that can be made ahead of time and kept in the refrigerator until the day of Thanksgiving. This can be made ahead of time and kept in the refrigerator and then cooked. Melt 2 tablespoons butter in a large skillet over medium heat. Stir in flour until smooth, and cook for one minute. Stir in the salt, sugar, pepper, garlic powder, onion, and sour cream. Add green beans, 1/2 can of french’s fried onions, and a handful of cheese and stir to coat. Transfer the mixture to a 2 1/2 quart casserole dish. Spread shredded cheese over the top. In a small bowl, toss together cracker crumbs, remaining fried onions and remaining butter, and sprinkle over the cheese. What is your favorite recipe for Stuffing/Dressing, Cranberry Sauce or Green Bean Casserole?